Dubai: Education leaders on Tuesday highlighted the need to use technology in the education system in order to raise the standards of schools in rural areas of developing countries. "The problem is that we set the target for a classroom but we do not think about how they benefit from being there. On an international level, you should not use traditional [teaching] ways in a classroom because in developed worlds, we still think of teaching in a static and unreformed way," said Tony Blair, Quartet Representative to the Middle East and Patron of the Tony Blair Foundation. During the Education Without Borders world forum, Blair participated in a panel discussion that was held under the theme, "Education — Going Global," where he explained that developing countries should not base their school curricula on outdated teaching methods but to focus instead on using innovative technology that will enable their quality of education. His views were supported by Chandrika Kumaratunga, former president of Sri Lanka, who agreed that education should be modernised in order for it to be effective, and that it also played a big role in solving social issues. 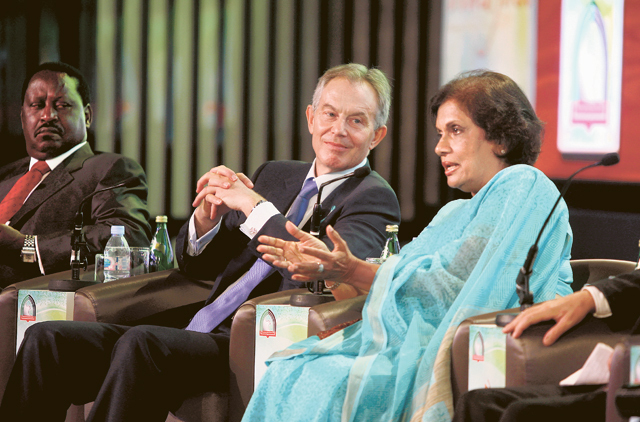 "The concept of education without borders has to move far beyond the traditional systems that we know, and it is important to include everyone [who are involved] socially, politically and economically," Kumaratunga said, during the panel discussion which included the topics of climate change and social conflict. Education reforms were introduced in Sri Lanka recently to modernise education and the method of teaching, as she pointed out, with new subjects introduced in the curricula, such as Peace Education, so that "they can celebrate the richness of diversity instead of rejecting it." The Prime Minister of Kenya, Raila Odinga, emphasised the Kenya Vision 2030 aims to develop several different economic zones in various parts of the country, and that education fell in the Vision's third pillar. "We are trying to learn from the best practices of the world, [which is a challenge because] it is not a unified society. While urban schools are adequately equipped, rural schools don't have electricity or proper buildings, and in our plans we are trying to ensure a transition from primary to secondary education, and then on to university," said Prime Minister Odinga. He said through Information Technology, the country was able to learn from other parts of the world and by promoting education it was also able to deal with social issues, such as discrimination against women. "We can see that technology has moved faster than society itself. In the world of globalisation we are moving away from depending on aid and moving towards an alternative of trade and investment."